If your website takes more than two seconds to load, you are losing thousands of visitors and potential customers. According to Kissmetrics, 47% of visitors expect the page to load in 2 seconds. When people leave your website, it increases your bounce rate. And a higher bounce rate means lower search engine rankings. Google wants to display the best possible results for every search query. And if your site doesn’t offer a great user experience, Google will drop your site like a stone. Next thing you know, your homepage is sitting on the 2nd page of search results. Moreover, after the recent algorithm updates, Google seems to prefer websites that are fast and mobile-optimized. So, whether you want to keep the free search traffic ball rolling or want to start getting some search engine traffic, you need to improve your website’s speed. If you don’t know how much time it takes your website to load, try this free tool by Pingdom which will give you an initial reading so you can see how much it has improved. Speeding up a WordPress website might sound like a daunting task that would take dozens of hours and a lot of technical know-how, but believe me, WordPress plugins and some simple tweaks will soon get your site loading a lot faster in no time at all – simply follow through our complete beginners guide below. Most web hosts advertise themselves as the fastest. But in reality, many of them don’t offer any speed advantage over the other hosts. The web hosting service you host your website with can make a huge impact on the speed of your website – A shared host which places many websites together on the same server can suffer from poor performance and one slow site can have an impact on everyone else’s websites. However, if you are just starting out with a small personal or hobby website, a shared hosting company can be fine if you know which one to pick. 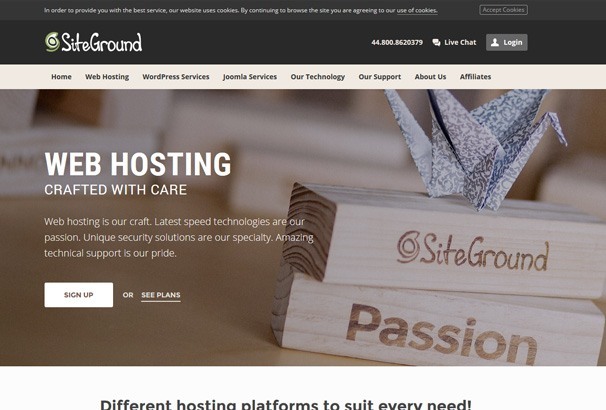 Our guide to shared hosting covers some different options for hosting so be sure to check it out. But as your audience starts to grow, consider moving your site to a Managed WordPress Hosting or a VPS server. A Managed host will generally be of a better quality than shared hosting, they will also take care of things like updating WordPress and any plugins you use, will offer backups, caching to help with site speed, they may include a CDN for speeding up your static items like images and scripts and so on. In the end, which host you choose will come down to your budget so choose wisely and make sure you monitor the speed and uptime of your site, you can always migrate your website to another host if you are receiving a poor quality service. Caching can have an enormous impact on the speed of your website. When someone visits a page on your website, WordPress runs thousands of lines of codes, connects to your database and then generates the requested web page. And as you might have guessed, this requires a lot of resources and time – This is where caching comes to rescue. Caching is a simple technique. Instead of generating a page over again and again, the application, WordPress in our case, generates the page as HTML, makes a copy and then serves that static HTML copy when the page is requested. When Caching is enabled on your website, it will cut the time and server resources required to generate a page in half. While WordPress doesn’t come with built-in caching functionality, there are dozens of free caching plugins available for WordPress. 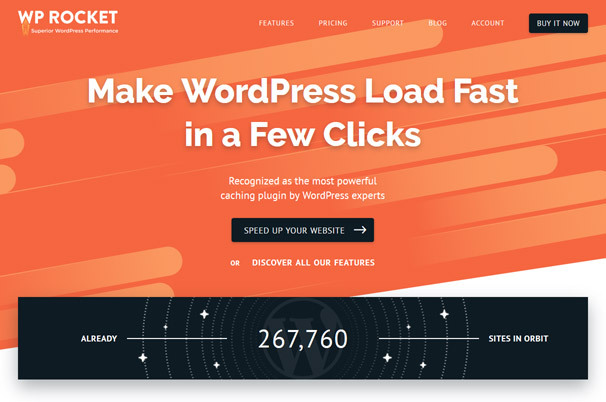 WP Super Cache is the best free Caching plugin and the one we would recommend, its easy to setup and makes a huge difference to your website loading times. try it out and test your site with Pingdom before and after you activate it, you will be surprised as the difference it makes. Another option, is WP Rocket, which is a premium plugin that costs $39 per year for one website. You might wonder why you would pay for a caching plugin when you can get one for free, the reason is in tests WP Rocket out-performs other caching plugins so if you are trying to get that extra last bit of speed out of your website it can make a difference. Due to the cost, we would recommend WP Rocket for commercial websites – otherwise WP Super Cache is fine for personal projects. The distance between your user and the server affects the speed of your website. While this might only make a small impact on the overall speed, it does add up. The further the user from your website’s server, the slower your website will load. A CDN (Content Delivery Network) solves this problem. It is simply a network of servers spread across the globe. When you connect your website with a CDN, the CDN service will start caching all your website content on its wide-spread network of servers. It will cache everything from files to your blog content. When someone visits your website, the CDN serves the content through a server nearest to the user. This not only reduces the load on your servers, but it also decreases the time it takes for the user to connect to the server and get the file. There are a lot of CDN services available but most of them can be very expensive. 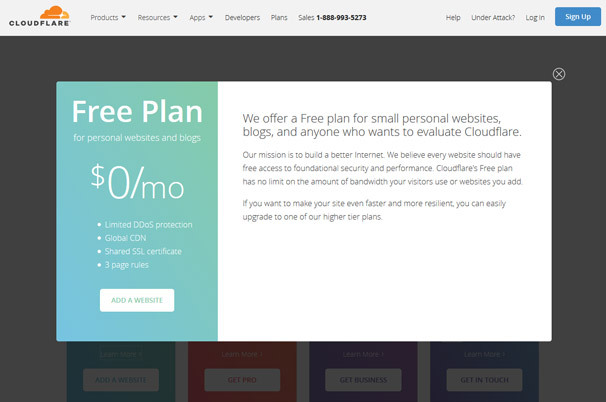 If you are just starting out, you should try CloudFlare. It’s free and the premium plans are relatively cheaper than other CDN service providers. You can download the free WordPress plugin to get started. Browsers load every single element of a page before they can start displaying it. Instead of caching the resources by default, they re-fetch all of them every time you load a different page on the same website. This not only increases the load on your servers but also increases the load time of your website. When you leverage browser caching, the browsers cache the static resources and then use a cached copy instead of requesting it again from the server. Images make up most of the size of your web pages. Most images don’t need to be viewed in high-resolution. These images can be optimized (compressed) for the web. When you optimize an image, the size of the image is reduced by almost more than half without any noticeable loss in quality. Now, you could just fire up Photoshop or any other image edit program to do it yourself. But that would require a steep learning curve and a lot of manual labor. Instead, you can use a WordPress a free plugin like WP-SmushIt to automatically do it for you. This plugin optimizes all the images on your website automatically. All you have to do is install it and it will take care of everything itself. WordPress needs to store a lot of data to make all its internal process work efficiently. And the more plugins you have, the more of this data WordPress will store in your Database. With time, a lot of this data becomes redundant. This data includes additional data for posts, pages, comments, and plugins. In the short-term, this redundant data doesn’t cost much of a problem but in the long-term, it will increase your website hosting costs and make your site slower. If you remove this data, it will make your database smaller resulting in small speed gains. Not to mention, all the web space usage and costs it will cut for you. Now, you don’t have to be a scientist to be able to optimize your database. You don’t have to be a programmer either. All you need is install a free plugin like WP-Optimize. Once you install this plugin, it will optimize your database by removing redundant data and optimizing your database tables. GZIP is a compression technology that can help you reduce the size of your web pages by more than half. When you enable GZIP on your server, all your files are compressed with GZIP before they are served to the browser. And when the browser received the GZIPped file, it knows how to decompress and display it. Most modern browsers support GZIP and for the ones that don’t your server will serve the content directly. GZIP can help you cut your website’s load time by more than half. Images make up as much as 80% of the load time for most web sites. And when browsers load a website, they don’t start displaying the page until they have downloaded all the resources including images. This is where LazyLoading comes to rescue. LazyLoading is a simple technique of loading the images only when they are visible to the user. So, if an image is at the bottom of the page, it will not be loaded until the user has reached the bottom of the page. This not only improves your site’s load times but also reduces the load on the server and bandwidth usage. To start using this technique, install, and setup the free BJ LazyLoad plugin. While all WordPress themes advertise that they are optimized for speed, the truth is most of them aren’t. The theme you are using on your blog plays a big role in determining your site’s speed. If you are using a theme that is badly coded and doesn’t follow any coding standards, you will end up with a slow loading site. Not only are a lot of themes not optimized for speed, they are often bloated with additional scripts and resources generated by using plugins like Page Builders, Sliders and other items you may not even be using. Investing in a good theme from the start of your blogging journey is really important. Because if you try to fix the speed issues caused by the code, you will end up paying thousands of dollars to a developer. And even if you decide to switch to a different theme, it can be hard to switch without breaking some of the functionality of your website. 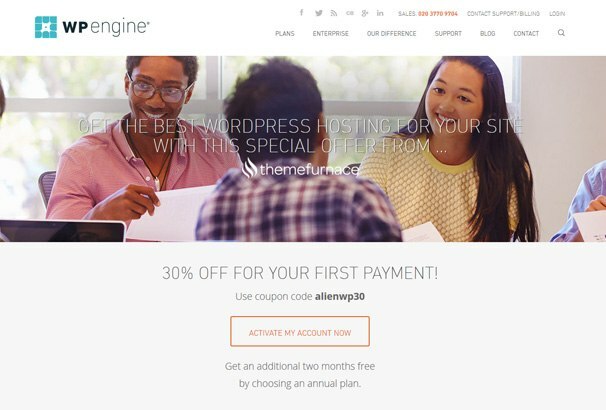 When looking for a WordPress theme, always use themes from trusted authors like ourselves. At AlienWP, we test and optimize all our themes for SEO and Speed. All our themes load up within just a few seconds. If you are getting a lot of comments on your blog, then it’s time to celebrate. It means you have an engaged audience that loves your content. But here’s the problem: Too many comments increase the size of your web pages. That means, the more comments you display on a page, the slower that page will load. Now, to solve this problem all you have to do is split the comments into multiple pages. What this will do is instead of displaying all the comments at the end of the post, WordPress will display pagination links at the end of the comments just like it does at the end of your blog roll. If your website is slow, act now. You are losing thousands of potential free website visitors and customers. Use the techniques in this article to speed up your WordPress website. Most of them don’t require you to touch a single line of code and don’t take much time to implement. If you don’t have much time to invest right now, at least make sure you are using a Caching plugin, your images are optimized and that GZIP is enabled on your server, this will help speed up your site significantly over a regular WordPress installation. If you have any suggestions, stories or feedback to share, feel free to speak your mind in the comments. The complete guide to optimize your wordpress website.